The carpet in a vheicle can be made from different materials. Knowing what materials are used can help to determine the best way to clean these without damaging the fibers. In general, most carpets are designed to withstand use and abuse while still offering a little bit of cosmetic value. There are several different materials that can be used in carpets. The general difference is due to the type of use it will see in its lifetime. The carpet in a workvan is mostly rubber and pvc, which can withstand the dirty boots, sand and construction materials it will come into contact with. The carpet in a luxury vehicle will be aimed at softness and looks, rather then its ability to withstand rough types of dirt. Rubber floormats of rubber carpet can be used in vehicles that see types of dirt that would otherwise damage or stain the material. Rubber has a very high resistance to chemicals, doesn’t show wear as much as many other materials and can stay anti-slip when wet. PVC can either show itself as very rough but short fibers used in floormats, or fairly solid plates of plastic carpets. They are very sturdy and have a high resistance against chemicals, dust, sand, dirt and liquids. They can be difficult to remove and moisture can get trapped underneath. Only rarely used in luxury vehicles. The fabric is very soft, but also difficult to maintain. Dust and dirt can get ingrained in the tightly packed fibers, which becomes difficult to remove. This type of polyester offers a synthetic mixture of qualities can be used in many different applications. Both the floormats and the carpet can be made from this materials. Although it feels rougher then fleece or cotton, it will still feel fairly soft and nice to the touch. It is cheap to make, easy to maintain and hols itself reasonably good against common dirt. The biggest reason for difference in material is cost, but this has also been pushed by the industry to match in situation. A nylon carpet in the boot is more capable of cooping with the type of use and abuse it will see. The large volume of material bought by the automotive industry has also brought the price down, making it an effective but also cheap option for manufacturers to use. Luxurious cars can still be outfitted with a different type of material, it will be more expensive, which is not likely to be a problem with this type of vehicle. The rubber floormats in a workvan are not the cheapest option, but will last a lot longer. This makes them the better option in the long run. Within the automotive industry and/or the world of detailing, it is not uncommon to get custom floormats made for a vehicle. This can be done with any choice of material. In general the rule is: you get what you pay for. Floormats or carpets are often similar in this. When looking at fabric floormats, there can be a difference in length of fabric, type and thickness of backing and amount of fibers per square inch. 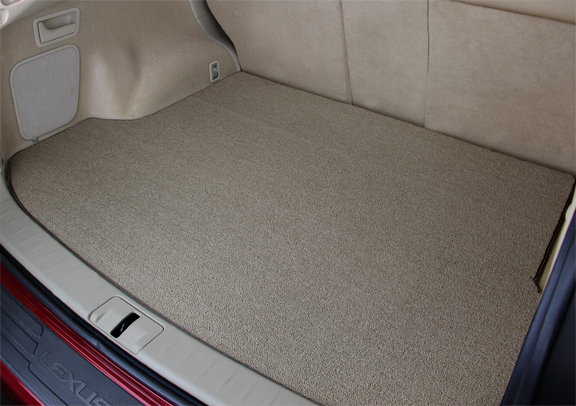 one floormats has fibers that are 3mm long, and have 600 fibers per square inch. The other floormat has fibers that are 2mm long and have 400 fibers per square inch. Both floormats are 15 inches wide and 27 inches long. A total of 405 square inch. Floormat 1 has 600 fibers of 4mm long per square inch. Which totals 2400mm of fiber per square inch. The total floormat would then be: 972000mm (972 meter) of fiber. Floormat 2 has 400 fibers of 3mm long per square inch. Which totals 1200mm of fiber per square inch. The total floormat would then be: 486000mm (486 meter) of fiber. The difference is 486 meters of fiber per floormat. In short, although the difference in length of fiber is only 1mm, you could make 2 floormats of example 2 from the fibers needed to create the floormat in example 1. This has a large impact on the production cost. A little bit more comfort and softness can therefor make a big difference in price.